After lots of brainstorming and scribbling with Steve's architect older brother (SO nice to have that free expertise in the family!) 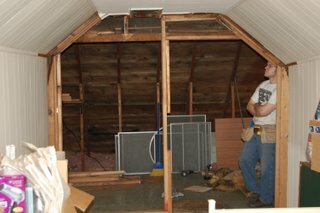 over Christmas break, we decided to begin remodeling the second level of our house. 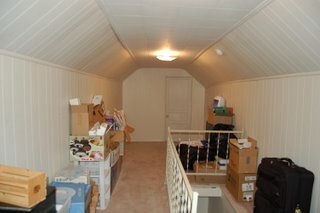 Currently, we don't use the upstairs at all except for storage; it consists of a long, narrow, relatively unusable space we like to call "the tunnel" (see photo: the previous owners billed this as a "third bedroom"...mmm-hmm) as well as a whole other unfinished area. The unfinished part already has floorboards and two windows (that open! as in, aren't painted shut! yippee! ), so it could easily be made into more living space. More pictures to come. This project will give me blog material for the better part of 2007, at minimum. Yes, I agree, it's nice to have a talented husband who also looks good in a tool belt. That project looks cool. I'm sure it'll take some creative thinking with the roof like that. I could imagine some pretty neat spaces though, created up there. What a fun project to do. And what a great space. We have a two story 1924 detached garage that looks like a little snow white cottage. I think we are going to start work on the second level and turn it into a bed and bath to rent. That will be our next major project. So fun huh!! Can't wait to follow yours. Wow! What a great project! I look forward to following the progress! BTW, thank you so much for the Christmas card-- I didn't have your address but am glad I do now :) I loved the picture!